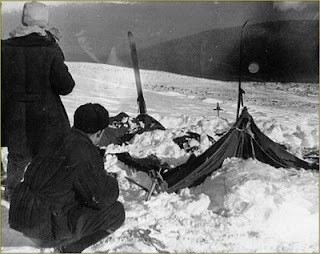 This is one of the most (if not the most) weird and mysterious incident in modern history, It happened on the east shoulder of the mountain Kholat Syakhl (a Mansi name, meaning Mountain of the Dead) on February 2, 1959 and resulted in the deaths of nine ski hikers. The lack of eyewitnesses and subsequent investigations into the hikers deaths have inspired much speculation. Investigators at the time determined that the hikers tore open their tent from within, departing barefoot in heavy snow. Though the corpses showed no signs of struggle, two victims had fractured skulls, two had broken ribs, and one was missing her tongue. According to sources four of the victims' clothing contained high-levels of radiation. There is no mention of this in contemporary documentation-it only appears in later documents. Soviet investigators determined only that "a compelling unknown force" had caused the deaths. Access to the area was barred for three years after the incident. The chronology of the incident remains unclear due to the lack of survivors. A group was formed for a ski trek across the northern Urals in Sverdlovsk, now Yekaterinburg. The group, led by Igor Dyatlov, consisted of eight men and two women. Most were students or graduates of Ural Polytechnical Institute, now Ural State Technical University. The goal of the expedition was to reach Otorten, a mountain 10 kilometers north of the site of the incident. This route, at that season, was estimated as "Category III", the most difficult. All members were experienced in long ski tours and mountain expeditions. The group arrived by train at Ivdel, a city at the center of the northern province of Sverdlovsk Oblast on January 25. They then took a truck to Vizhai - the last inhabited settlement so far north. They started their march towards Otorten from Vizhai on January 27. The next day, one of the members (Yuri Yudin) was forced to go back because of health problems. The group now consisted of nine people. It had been agreed beforehand that Dyatlov would send a telegraph to their sports club as soon as the group returned to Vizhai. It was expected that this would happen no later than February 12, but when this date had passed and no messages had been received, there was no reaction—delays of a few days were common in such expeditions. Only after the relatives of the travelers demanded a rescue operation did the head of the institute send the first rescue groups, consisting of volunteer students and teachers, on February 20. Later, the army and police forces became involved, with planes and helicopters being ordered to join the rescue operation. On February 26, the searchers found the abandoned camp on Kholat Syakhl. The tent was badly damaged. A chain of footprints could be followed, leading down towards the edge of nearby woods (on the opposite side of the pass, 1.5km north-east), but after 500 meters they were covered with snow. At the forest edge, under a large old pine, the searchers found the remains of a fire, along with the first two dead bodies, those of Krivonischenko and Doroshenko, shoeless and dressed only in their underwear. Between the pine and the camp the searchers found three more corpses—Dyatlov, Kolmogorova and Slobodin—who seemed to have died in poses suggesting that they were attempting to return to the camp. They were found separately at distances of 300, 480 and 630 meters from the pine tree. Searching for the remaining four travelers took more than two months. They were finally found on May 4, under four meters of snow, in a ravine in a stream valley further into the wood from the pine tree. An examination of the four bodies which were found in May changed the picture. Three of them had fatal injuries: the body of Thibeaux-Brignolle had major skull damage, and both Dubunina and Zolotarev had major chest fractures. The force required to cause such damage would have been extremely high, with one expert comparing it to the force of a car crash. Notably, the bodies had no external wounds, as if they were crippled by a high level of pressure. One woman was found to be missing her tongue. There had initially been some speculation that the indigenous Mansi people might have attacked and murdered the group for encroaching upon their lands, but investigation indicated that the nature of their deaths did not support this thesis; the hikers' footprints alone were visible, and they showed no sign of hand-to-hand struggle. Traces from the camp showed that all group members (including those who were found injured) left the camp of their own accord, on foot. To dispel the theory of an attack by the indigenous Mansi people, one doctor indicated that the fatal injuries of the three bodies could not have been caused by another human being, "because the force of the blows had been too strong and no soft tissue had been damaged". After the funerals, relatives of the deceased claimed that the skin of the victims had a strange orange tan. A former investigating officer said, in a private interview, that his dosimeter had shown a high radiation level on Kholat Syakhl, and that this was the reason for the radiation found on the bodies. However, the source of the contamination was not found. Another group of hikers (about 50 kilometers south of the incident) reported that they saw strange orange spheres in the night sky to the north (likely in the direction of Kholat Syakhl) on the night of the incident. Similar "spheres" were observed in Ivdel and adjacent areas continually during the period of February to March 1959, by various independent witnesses (including the meteorology service and the military). Some reports suggested that much scrap metal was located in the area, leading to speculation that the military had utilized the area secretly and might be engaged in a cover-up. What really happened on that tragic day, it is still unknown. Tell everyone what you think about it by posting a comment. Umm... ok. The article seems to be true in facts, except for a number of details missed or omitted herein. First, they did not loose their direction and they stopped at the Kholyat-Syakhyl, as scheduled. Some think they stopped there for the second time: after they had finally built the storage of surplus food in the woody valley and came back to the slope next day. They knew about the schedule delay, but they considered it ok.
Secondly, there was no army engaged in searching: only guards from a nearest prison camp. There were no police: only one detective and representatives from KGB afterwards. Third, yes, indeed, one girl, Dubinina, had her tongue missing...but...she was lying in the ravine facedown, immersed into a brook with her mouth opened. The tongue just decomposed also thanks to the brook habitants. Moreover, those two at the pine tree (Cedar in Russian) had no eye-bulbs and nose tips and had the legs and hands burnt. Yeah, by the way, fewer foreign people know that before the accident Dubinina wrote down in her diary the words "I...brook". The words resulted from her guessing the Mansi symbols left on the trees. Another info for those who are interested: Yuri Krivonischenko and Nicolai Thibeaux-Brignolle worked at a secret plant specialized in radioactive materials. Alexander Zolotarev, as they say and some facts testify, was somehow connected with KGB. Also, there was some kind of a love triangle between some of’em, but it is not the case for the accident. Besides, Dyatlov, Slobodin and Kolmogorova had their mouths and noses bleeding. Blood remained on the snow they were found. More details I left unsaid because of saving your time. I've been interested in this incident for some years, that's why I am still in search for the right answer. I have written an article on the same subject and posted my thoughts about the weird tan, missing tongue etc. and how most of them can be explained with the exception of why they ran out of their tents in the first place. This incident has truly fascinated me since I discovered it a few weeks ago. I really don't know what to think. Some people think they were attacked by aliens or Bigfoot. Maybe there was madness in the air...or one of the team members decided to kill their fellow hikers and themselves. Whatever happened, I agree that it was a truly, truly tragic occurence. Interesting how there seems to be a lot of interest in this recently. I read about this by chance of Wikipedia, now I've read every every version of events on the internet! I'd love to find out the real story behind the events. Maybe someday the Russian government will come clean and the answers will be revealed. 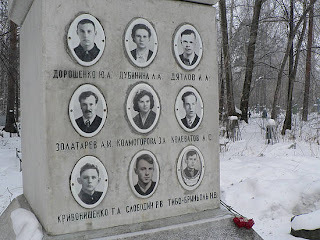 I think that it is so interesting because the lack of eyewitnesses and subsequent investigations into the hikers' deaths have inspired much speculation.I agree with it It had been agreed beforehand that Dyatlov would send a telegraph to their sports club as soon as the group returned to Vizhai. Constantine, Siberia thank you for the very informative post. You're welcome. Any time, if ya need more. Constantine, could you please share more information about the projects that Yuri Krivonischenko and Nicolai Thibeaux-Brignolle where involved? And more information of the involvement with KGB? I've heard avalanche. Which makes sense for the crushing injuries. Bodies left out for days before discovered explains the sun burned (orange) skin. Animals typically go for soft tissue explains the missing tongue. Usually when you begin to experience hypothermia you begin to start taking off your clothes. Can't explain the radiation tho. You must conclude that this the work of aliens. One had her tongue missing;just like cattle mutilations in the states. UFOs were seen in the area in both cases.The animals mutilated in the states also have levels of raditation. Too strange and weird .